Michigan Meetings and Events Magazine has named Traverse City Tourism the best Convention and Visitors Bureau in the state of Michigan. Results were announced May 14 at the magazine's Tenth Annual “Best of” Awards Dinner in Port Huron. 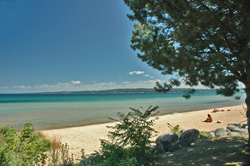 Traverse City has emerged as a tourism powerhouse in recent years, and much of the region’s success is a credit to Traverse City Tourism. Michigan Meetings and Events Magazine has named Traverse City Tourism the best Convention and Visitors Bureau in the state of Michigan. Each year the magazine’s readership of more than 20,000 convention and meetings industry professionals vote on their favorites in 21 different categories. Results were announced May 14 at the magazine's Tenth Annual “Best of” Awards Dinner in Port Huron. Also named best in their categories were seven other Traverse City entities: the Grand Traverse Resort & Spa (Best Hotel with Meeting Space/Over 200 Rooms, Best Golf Resort), Sarah Brown Photography as Best Photographer, Short's Brewing Company(Best Craft Brewery/Brewpub), Chateau Chantal Winery(Best Winery), Catering by Kelly’s (Best Caterer), and Events North (Best Meeting Planning Company). In addition, Rachel Jarosz, senior meetings and event manager at Events North was elected to the magazine’s 2015 Hall of Fame as Best Up-and Coming Event Planner. Several local nominees were also runners-up in a number of categories: the Grand Traverse Resort & Spa as Best Ballroom, Kirkbride Hall and The Corner Loft as Best Intimate Venue, Kirkbride Hall as Best New Venue, Brian Walters as Best Photographer, Turtle Creek Casino & Hotel as Best Casino, Shanty Creek Resorts as Best Hotel with Meeting Space/More Than 200 Rooms, Best Ski Resort and Best Golf Resort, and Best Service, Red Ginger as Best Restaurant with Private Dining Space, Black Star Farms as Best Winery, Events North as Best Event Planning Company, and Celtic Shuttle as Best Transportation.